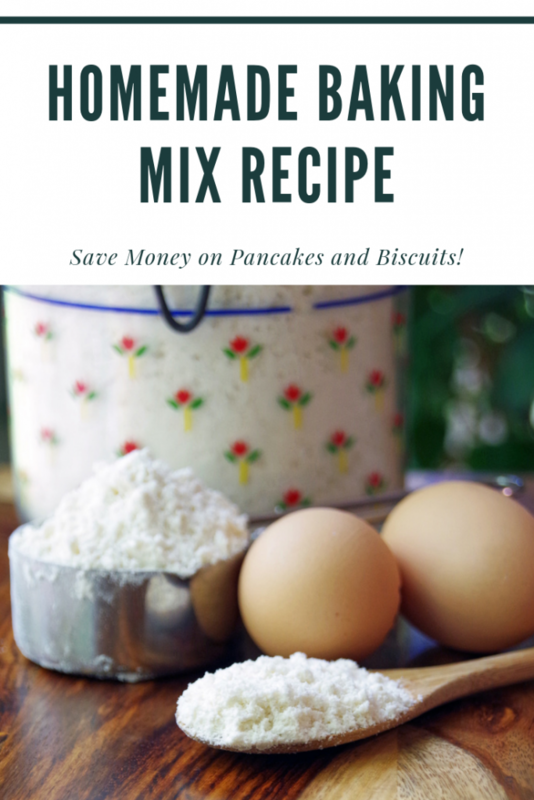 This easy homemade baking mix recipe takes only minutes to make and will save you money! With one kid in college and another heading there soon, I am looking to save money at the grocery store. How many times have you put something in the cart that you could make at home for less? From precut fruit to premade biscuit mix, you pay for the convenience of many foods. Making your own baking mix is easy and you can use it in any recipe that calls for a boxed baking mix. There are many items that get put into our grocery carts that are purchased for convenience. Lives get busy and time in the kitchen is often cut short by other obligations. Finding a bit of extra time to learn to ‘do it yourself’ can not only reduce your carbon footprint but also save you a significant amount of money. Baking mix takes only minutes to make at home and is shelf stable for months in your pantry. Instead of buying a large box of premade baking mix, consider making it from scratch this month. 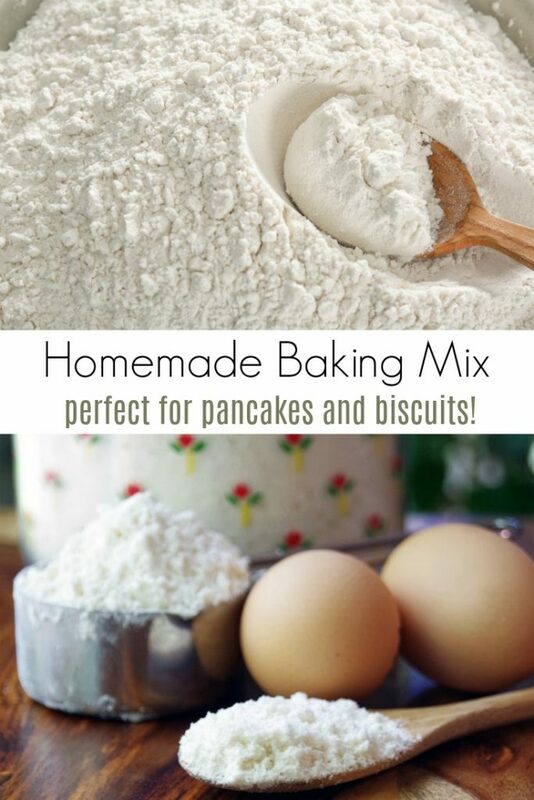 This homemade baking mix recipe can be used in place of name brand mixes to make pancakes and biscuits. Check out my review of the DIY pantry mixes cookbook for more homemade pantry mixes. 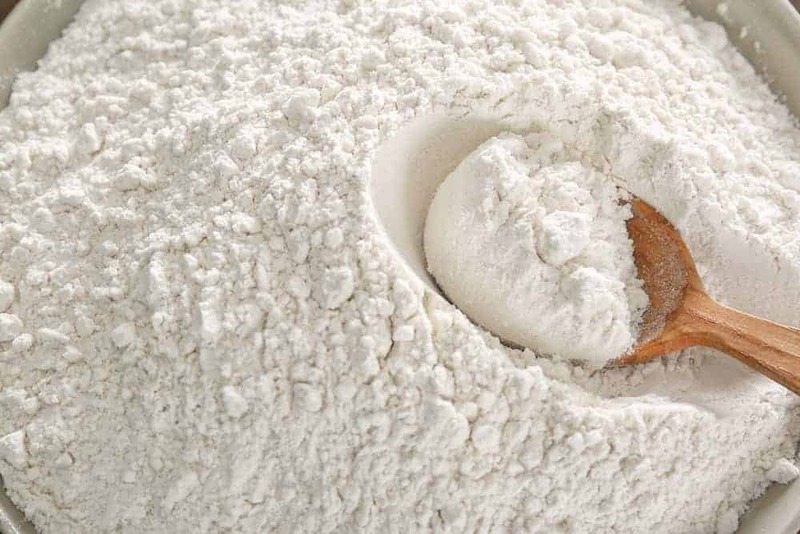 Homemade dry baking mix is simple to make, however, these tips will make it even easier! 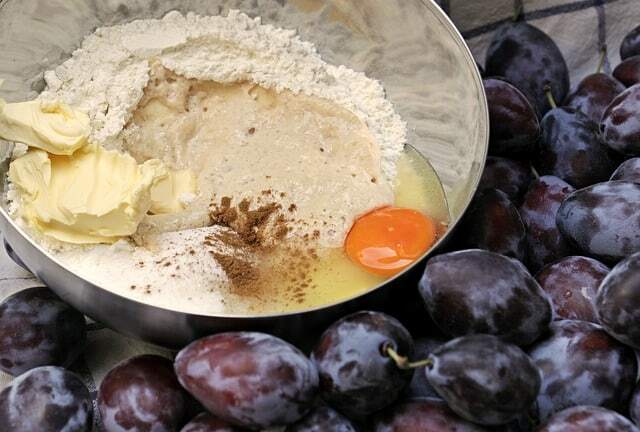 If you do not have a food processor, shift together the flour, baking powder, and salt into a large bowl. Don’t rely on just a wooden spoon to mix it up. You won’t get even mixing of the dry ingredients. Cut in the shortening with a fork or pastry blender until the mixture is similar in texture to cornmeal. Once the mixture is well combined, place the biscuit mix in an airtight container. Include a “use-by” date on the container. Use the use by date of the shortening package. Store your homemade baking mix recipe in a cool, dry place. You can also freeze this homemade baking mix for 6 months or so with no problem. Use this homemade dry baking mix in recipes that call for Bisquick or all-purpose baking mix. Bisquick Sausage Balls: This version from The Wicked Noodle has only 4 ingredients and will be a huge hit as an appetizer at your next party. Baked Blueberry Pancakes: Try these baked blueberry pancakes from Taste of Home if you don’t want to man the skillet all morning. Bisquick Chicken and Dumplings: A classic favorite! Try this recipe from The Weary Chef. 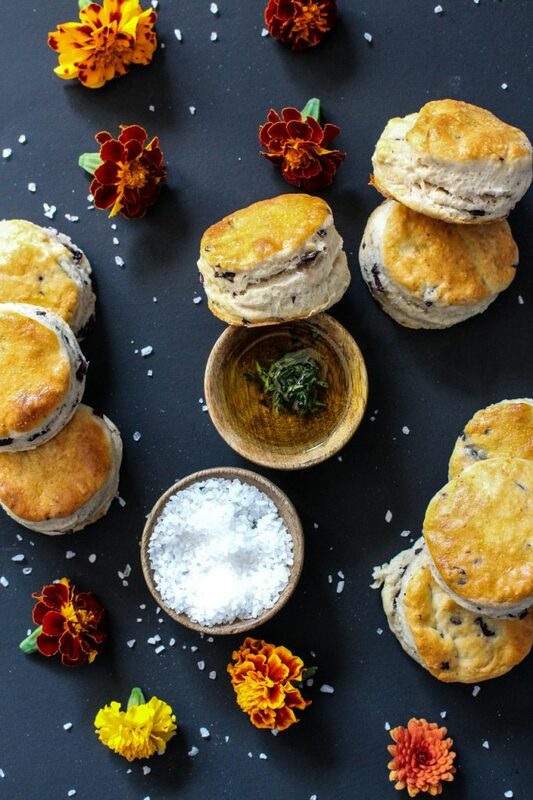 There’s no need to ever buy a boxed baking mix ever again. It is incredibly easy to make your own homemade baking mix with ingredients that you already have in your pantry. While you can get fancy and try buttermilk baking mixes or a heart smart Bisquick substitute, I find that simple is better. 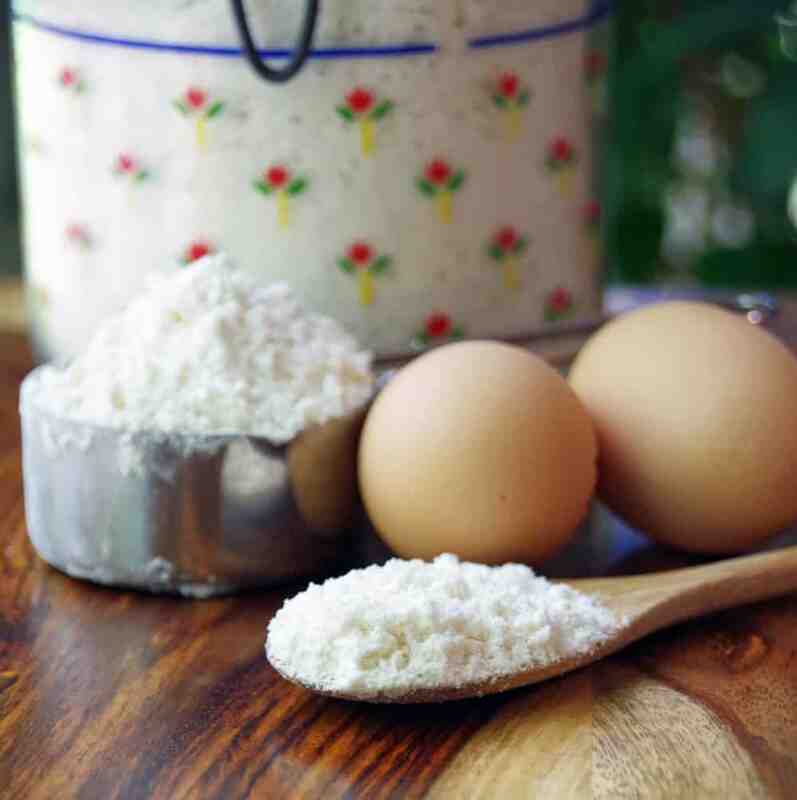 Here are the basic ingredients you will need for this easy homemade baking mix recipe. When making this homemade dry baking mix, I go with unbleached flour and sea salt. I think those are the least processed choices and the perk of making your own baking mix is choosing simple ingredients. Give your homemade biscuit mix as a gift to friends and family with a biscuit cutter in a pretty glass jar! This is a basic dry baking mix recipe. Making your own baking mix like Bisquick with this easy 4-ingredient DIY recipe will help you save money at the grocery store. Use this homemade baking mix straight from the freezer or pantry in any recipe that calls for pancake mix or Bisquick. This recipe for homemade all purpose baking mix makes about 3 cups. Make a larger batch if needed. To use for pancakes: Combine 2 cups baking mix, 1 cup milk and 2 eggs in a bowl. Mix well and follow your normal pancake making process. For all purpose baking mix biscuits: Combine 2 cups baking mix with 1 cup milk. Stir until combined. Drop ¼ cup amounts onto a greased cookie sheet. Bake at 450 for 10 to 15 minutes or until golden brown. Other uses: This homemade dry baking mix is interchangeable with most major brands. Check the back of each box for other recipes for your homemade baking mix! This homemade baking mix recipe uses only 4 ingredients. Making your own baking mix is easy and you can use it in any recipe that uses boxed baking mix. Place all ingredients in the bowl of your mixer and mix on medium low speed until completely combined.